I’m willing to bet that a certain friend of mine is thrilled that today is Squirrel Appreciation Day. She loves squirrels like no one I’ve ever known before. 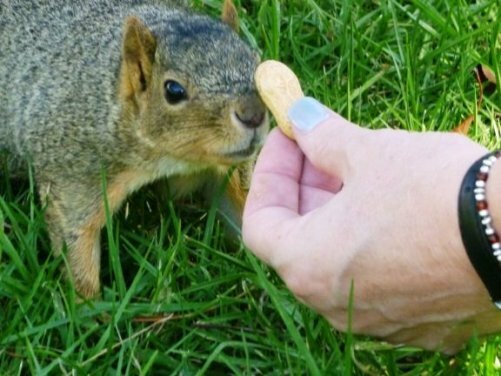 In fact, the pictures contained in this post are of her feeding peanuts to a couple of the little guys. 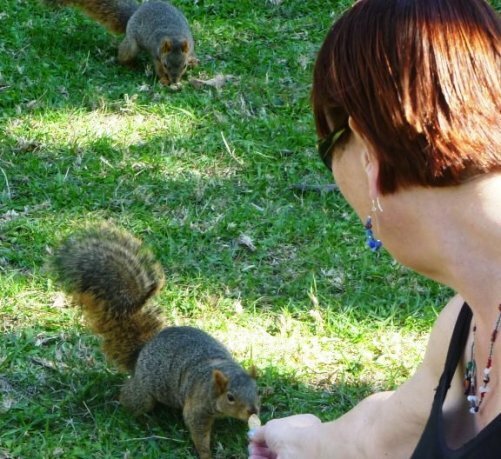 Squirrel Appreciation Day was created by Christy Hargrove, a Wildlife Rehabilitator from Asheville, North Carolina who is affiliated with the Western North Carolina Nature Center. – There are more than 300 different species of squirrel. – Squirrels range in size from the five inch African Pygmy Squirrel to the three foot Indian Giant Squirrel. – As wild animals go, squirrels have been the most successful at adapting to their surroundings, easily modifying their behavior in order to survive in both a fragmented habitat and urban setting. – When hiding their food, squirrels put on an elaborate show with several “fake outs” before finally settling on a spot to bury it. – Squirrels do not remember where they bury their nuts. When it comes time to unbury their stash, some of the nuts are found but most are either found by other squirrels or are never dug up. – In 1987 and again in 1994, squirrels were responsible for bringing down the NASDAQ stock market after coming into contact with wiring. – After studying the rapid evolutionary response of Yukon Red Squirrels to their environmental changes, scientists were able to document for the first time, genetic changes in a mammal created by global warming. – In an effort to increase the chance of survival for their babies during the first year of life, mother squirrels have been known to give their offspring parts or all of their critical food cache. – Keeping in mind that dangers such as predators and environmental changes make it difficult for squirrels to live long lives, their life span is about a decade. Red Squirrels can live up to 9 years, Fox Squirrels live about 10 years, Southern Flying Squirrels can make it about 13 years, and Eastern Gray Squirrels have been known to live up to 15 years. No matter how cute you may find your neighborhood squirrel to be, you must remember at all times that ultimately they are a wild animal with wild animal tendencies – like unpredictable behavior and fondness for disturbing gardens. If you find an abandoned baby or injured squirrel, contact a professional immediately. Call a local veterinarian and ask them who to get in touch with as well as how to properly and safely handle the animal until the wildlife rehabilitator is able to help. Not only is it illegal to keep a squirrel as a pet (some states say it’s ok with a special permit), it’s just plain a bad idea. Not only is the unnatural captivity unfair to the animal, the squirrel could very well cause great damage to your house and the people who live in it. Of course, there are exceptions to every rule…..
Finnegan, the baby Squirrel Dog…. Squirrels belong outside; which can be a problem if you have an area you want them to stay far away from like a garden, bird feeders or tool shed. In an effort to keep squirrels away from a building like a tool shed or outdoor pantry, soak cotton balls in peppermint oil and place them around the outside of the structure. The smell is pleasant for humans, but too strong for squirrels and keeps them at bay. When it comes to bird feeders, there’s really no such thing as “squirrel proof.” While you can come close to it, squirrels are smart and as I mentioned before adapt well to change. It’s just a matter of time before they figure out how to get to that food! There are, however, a few things you can do to hopefully divert the attention of the squirrels away from your bird feeders. Try placing the bird feeder away from trees and other objects that squirrels can use to leap to the feeder or put food out that is specifically for the squirrels, like unsalted peanuts, bread, or small veggies and fruits. But don’t put out too much because the hungry squirrels will take it all and you might end up with a bunch of unhealthy little animals in your backyard. You can use the same tactic mentioned above for buildings with your garden. For potted plants or plants in raised beds, cover the top soil with rocks, leaving nothing visible to squirrels that may be tempting to dig. Squirrels can be great fun to have around your yard if you provide the best environment for both you and the squirrel. Let Squirrel Appreciation Day be your reason to find out all you can about squirrels and how you can live in harmony with them! After all, it’s what the holiday is all about! This entry was posted on Thursday, January 12th, 2012 at 12:14 AM	and is filed under Misc.. Both comments and pings are currently closed.